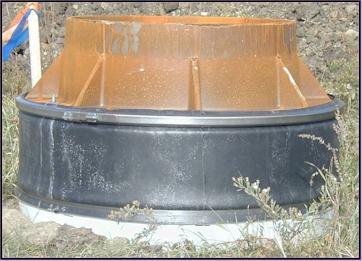 Source: Parson Environmental Products, Inc.
SurSeal is an External Manhole Frame/Chimney Seal which provides a permanent, flexible, watertight seal between the manhole casting and the concrete cone. It combines the advantages of a mechanical seal with the added assurance of a pliable gasket. SurSeal requires no special tools, Primers, or torches for installation. The same nut-driver used to tighten pipe to manhole connectors and flexible couplings is used to tighten the top and bottom bands on the SurSeal. Click here to read the full data sheet.